Who is advising our female astronomy students? Genders of advisors and their students in our survey. These numbers are based on the 2959 students that 252 respondents reported they had advised over the past 5 years. The students are separated by education level (high school through postdoctoral) and gender (green for female, yellow for male), while the bar graphs indicate the fraction of students in each subgroup advised by a male or female (total numbers of students in each subgroup are listed outside each bar). The fraction of female students advised by female advisors decreases with later educational levels, as low as 26% at the postdoctoral level. Male students, on the other hand, are advised by male advisors 65-74% of the time. I’m currently completing the write-up for a study Jacqueline Faherty and I did for the Women in Astronomy 2009 conference this past October, looking at perceptions of inappropriate behavior between students and advisors in astronomy (see the next blog post). We polled 579 students, researchers, teachers, staff and other astronomy affiliates as part of an online survey to examine how perceptions of behavior change according to gender, age, professional status, etc. Our results (when we’re finished writing them up!) will eventually be posted here. In the course of analyzing the mounds of biographical data we collected from our respondents, there was one thing I realized we could look at: who is advising our female students? One of the issues that continually comes up in addressing the disparity in gender representation in professional astronomy is the problem that female students are less likely to have a female advisor. I realized that with our survey data we could actually measure this, as we explicitly asked respondents who indicated that they were advisors how many students they had advised over the past five years, and what the genders of those students are. 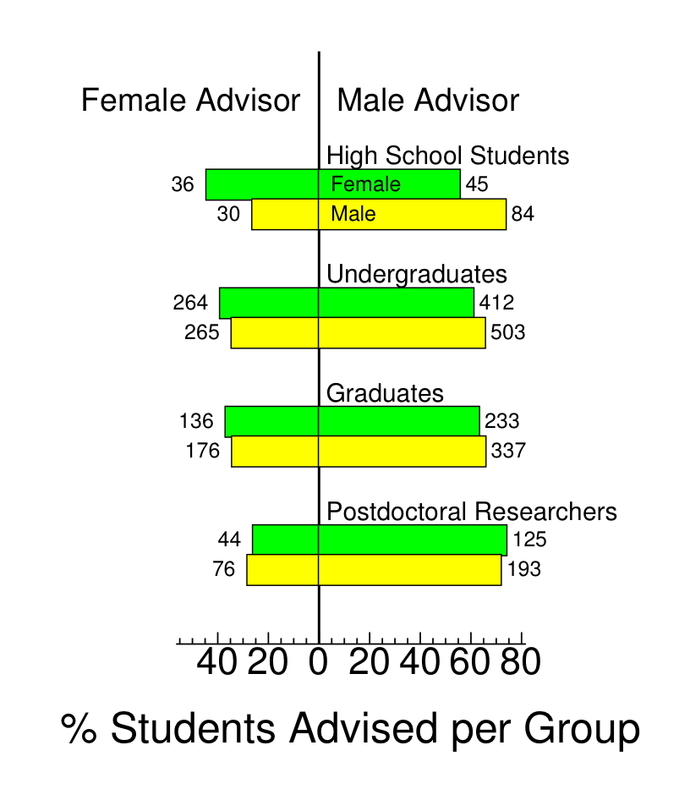 By matching these statistics with the gender of the respondents, we get a measure of the gender match between students and advisors in astronomy overall. My graduate student Jackie Faherty and I are running a survey about perceptions of appropriate behaviors between students and advisors in astronomy, as part of our contribution to the 2009 Women in Astronomy and Space Science Meeting. We came up with 10 scenarios that one or both of us have experienced as advisors and/or students where the appropriateness of the situation or behavior could be ambiguous depending on your gender, age or professional status. The survey runs through the end of October, so if you are an astronomer or interested in astronomy, and have dealt with advisor/student issues, please take our survey – it only takes 10 minutes! Results will be posted at http://www.browndwarfs.org/wia2009 in November.